Thousands of families affected in #KeralaFloods need your help! >> WASH awareness sessions in schools of Sindupalchowk in Nepal. >> An orientation program on community based disaster-risk reduction was conducted where beneficiaries were informed on types of hazards, vulnerabilities and necessary steps to be taken at the University College, Munshiganj Bangladesh. >> Pragya Solutions held a bilateral meeting with the Executive Magistrate, Lohaujong (Upazilla Nirbahi), Bangladesh, regarding the existing government programs & gaps pertaining to the displaced families of the Char communities and the required disaster risk reduction measures. >> Health camps were organised for people in rural Assam under the project on resilient livelihood & safe water access in flood-hit areas in Assam. Recurrent droughts & floods are the source of much suffering for the rural poor who are also the most vulnerable. The problem is magnified in remote and less-developed areas where safeguards are the least and preparedness poor, while their inaccessibility hinders quick response and relief by agencies. Climate change has also brought in a new threat of increasingly frequent environmental disasters, among them being receding glaciers, recurrent droughts, flash floods, Glacial Lake Outburst Floods and the immense destruction caused by them to life and property. Rapid and escalating desertification is a slow threat that the agro-pastoral communities in these areas have to contend with, with the associated impacts on livelihoods. 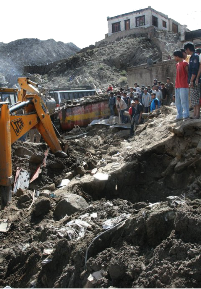 Pragya is studying the phenomenon of climate change induced disasters, and providing inputs for policy action and catalyzing micro insurance and credit to address disaster-related needs. 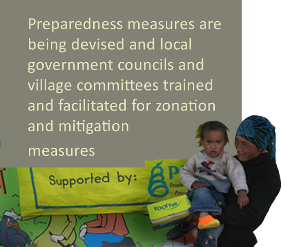 Preparedness measures are being devised and local government councils and village committees are being trained and facilitated for zonation and mitigation measures. Children and youths are being trained for preparedness and relief activities, and villages equipped with food and fodder security systems. 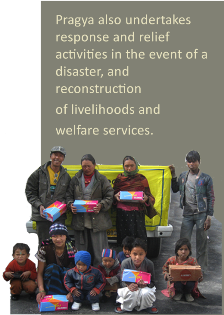 Pragya also undertakes response and relief activities in the event of a disaster, and reconstruction of livelihoods and welfare services.